Sir Paweł Edmund Strzelecki KCB CMG FRGS F.R.S. 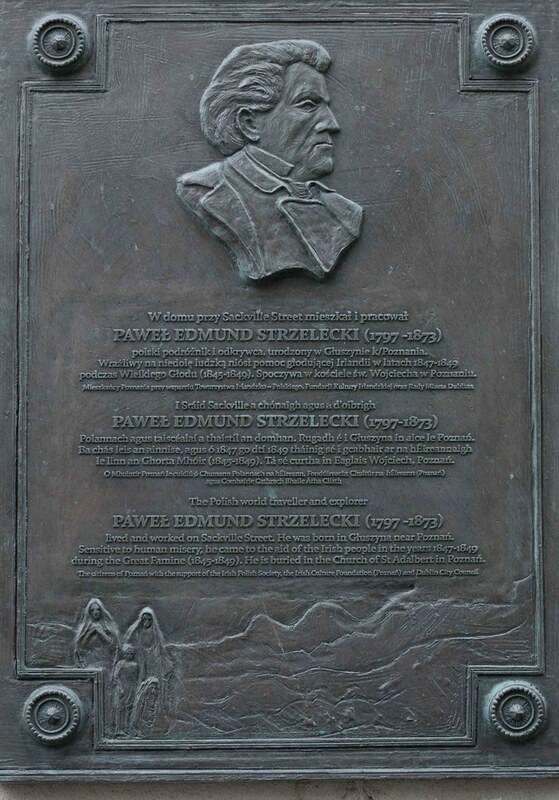 24 June 1797 – 6 October 1873), also known as Paul Edmund de Strzelecki, was a Polish explorer and geologist who in 1845 also became a British subject. Strzelecki was born in Głuszyna (then part of South Prussia, today part of Nowe Miasto, Poznań), Greater Poland, in 1797, the third child of Franciszek Strzelecki, a Polish nobleman (Szlachta) leasing land, and his wife, Anna Raczyńska. In Australia, Strzelecki was called a Count, though there is no proof that he actually approved or used such a title himself. Strzelecki served shortly in the Prussian army in the 6th Regiment of Thuringischen Uhlans, at the time known as Polish Regiment because so many Poles served on the staff. However the stiff Prussian drill did not agree with his character and he submitted his resignation and returned home. There are some suggestionsthat he deserted the Regiment but in the official history of the Regiment the name Strzelecki does not appear. Not long after, he became a tutor at the manor of local nobility. He felt in love with his young student, a girl of 15, Adyna Turno, but was rejected as a suitor by her father, Adam Turno. There are stories that Strzelecki attempted unsuccessfully to elope with Adyna, but biographers find this unlikely. Adyna and Strzelecki exchanged letters over 40 years but they never married. Strzelecki, provided with funds by his family, travelled in Austria and Italy. He eventually came under the notice of Prince Sapieha, who placed him in charge of a large estate in the Russian-occupied part of Poland. Strzelecki was then about 26 years of age and carried out his duties very successfully. Some years later the prince died, and a dispute arose between his son and heir, Eustace, and Strzelecki. Eustace refused to pay Strzelecki the prince's bequest – a huge sum of money and a considerable estate – accusing him of bad faith and prevarication. After four years the dispute was settled. Strzelecki left Poland about 1829 and stayed some time in France, from where he travelled to Africa. On 8 June 1834 he sailed from Liverpool to New York. He travelled much in North and South America, Cuba, Tahiti and the South Sea Islands, and went to New Zealand probably about the beginning of 1839. He arrived at Sydney on 25 April 1839. At the request of the Governor of New South Wales, Sir George Gipps, he made a geological and mineralogical survey of the Gippsland region in present-day eastern Victoria, where he made many discoveries. He discovered gold in 1839, however, Gipps feared the effects of gold on the colony and persuaded Strzelecki to keep his discovery secret. Later in 1839 Strzelecki set out on an expedition into the Australian Alps and explored the Snowy Mountains with James Macarthur, James Riley and two Aboriginal guides: Charlie Tarra and Jackey. In 1840 he climbed the highest peak on mainland Australia and named it Mount Kosciuszko, to honour Tadeusz Kościuszko, one of the national heroes of Poland and a hero of the American Revolutionary War. On Victorian maps (never on New South Wales maps) the name Mount Kosciusko was erroneously connected to the neighbouring peak, at present known as Mount Townsend and causing later many confusions, including the recent incorrect information on swapping the names of the mountains. From there Strzelecki made a journey through Gippsland. After passing the La Trobe River it was found necessary to abandon the horses and all the specimens that had been collected, and try to reach Western Port. For 22 days they were on the edge of starvation, and ultimately only saved by the knowledge and hunting ability of their guide Charlie, who caught native animals which they ate. The party, practically exhausted, arrived at Western Port on 12 May 1840 and reached Melbourne on 28 May. From 1840 to 1842, based in Launceston, Tasmania (then known as Van Diemen's Land), Strzelecki explored nearly every part of the island, usually on foot with three men and two pack horses. The Lieutenant-Governor, Sir John Franklin, and his wife, Lady Jane, afforded him every help in his scientific endeavours. Strzelecki left Tasmania on 29 September 1842 by steamer and arrived in Sydney on 2 October. He was collecting specimens in northern New South Wales towards the end of that year, and on 22 April 1843 he left Sydney after having travelled 11,000 kilometres (7,000 miles) through New South Wales, Victoria and Tasmania, examining the geology along the way. He went to England after visiting China, the East Indies and Egypt. In 1845 he published his Physical Description of New South Wales and Van Diemen's Land which was awarded in May 1846 the Gold Medal of the Royal Geographical Society. In 1845 he became a naturalised British subject. Towards the end of 1846, the Great Irish Famine was under way and the British Relief Association formed with the sum of £500,000 subscribed for the relief of the sufferers. Strzelecki was appointed an agent of the Association to superintend the distribution of supplies in County Sligo and County Mayo. He devoted himself to his task with success, though for a time incapacitated by famine fever. In 1847/48 he continued his work in Dublin as sole agent for the association. In recognition of his services he was made a Companion of the Order of the Bath (CB) in November 1848. He helped impoverished Irish families to seek new lives in Australia. He was also active in helping injured soldiers during the Crimean War (being personally acquainted with Florence Nightingale). He arrived back to London in 1849, where he was made a Fellow of the Royal Geographical Society and awarded a Gold medal for "exploration in the south eastern portion of Australia". The society still displays his huge geological map of New South Wales and Tasmania for public viewing. He was also made a Fellow of the Royal Society. He gained widespread recognition as an explorer as well as a philanthropist. Strzelecki died in 1873 in London of liver cancer and was buried in Kensal Green Cemetery. In 1997 his remains were transferred to the crypt of merit of St. Wojciech Church in his home town of Poznań, Poland.